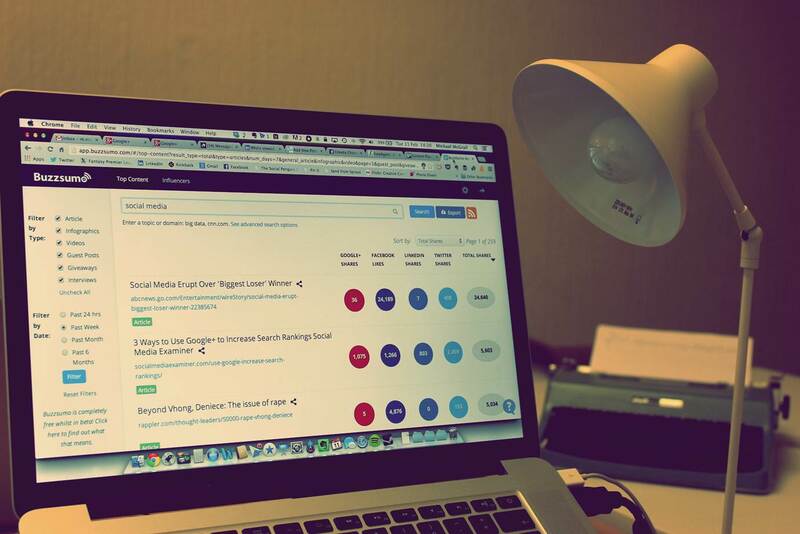 BuzzSumo - A Content Marketer's Dream Tool? Gathering these insights in 1 place can be difficult. Thankfully, a very cool tool I’ve discovered called BuzzSumo can help. BuzzSumo is basically the “Google of social search”. It lets you enter any topic (or domain like digitalinformationworld.com), and it’ll show you the most shared articles for that keyword across all the major social networks for any time period. Let’s have a look at some concrete ways in which BuzzSumo can help us. Discover what content people are sharing the most in your niche. By far, the most useful feaure of BuzzSumo is the ability to show me what people love to share. Let’s say I am writing content on the topic “Mobile Learning”. I can do a quick BuzzSumo search on Mobile Learning. As you can see below, BuzzSumo immediately shows me the most shared content on mobile learning in the last day, last week, last month or last 6 months. I can reorder the search results by social network to find the most shared content on say Twitter or LInkedIn; and I can analyze the headlines that are being shared. I can further filter by type of content such as articles, videos and infographics. Thus let’s say, I am planning an infographic, I can brainstorm ideas by searching for the most shared infographics on mobile learning, as shown below. With BuzzSumo, I can quickly develop a sense of what my audience wants to read. Perhaps the most shared articles are covering a major event that happened in your industry (ie articles on Facebook’s acquisition of WhatsApp appear in the top 3 results when I search for “startups” in the past month). If so, you might want to write about those topics by formulating your own opinion. Or you might discover the most shared articles are long-form content or “ultimate” guides, in which case you should make your content as comprehensive as possible. You can even analyze qualities of the most shared content such as the format, style, and tone. Do people tend to share articles that are casual with lots of visuals, such as BuzzFeed articles? Or is it more serious, and educational such as the content often featured in Social Media Today? Now, you shouldn’t base your entire content strategy on what BuzzSumo tells you; your audience is most likely unique, but it can definitely inform your content strategy. It can be extremely useful to see what’s been successful in the past, especially if you’re writing on a topic you know very little about. While using BuzzSumo, I sometimes find articles that have a lot of social shares, but aren’t that impressive, in terms of quality. In these cases, perhaps the writer just reached out to a lot of influencers and asked them to share it. With BuzzSumo, I can see if this was the case. Next to each search result, if I click on the ‘view sharers’ button, I can see a list of people who shared the article on Twitter, as shown below. This is incredibly useful, especially if you’re writing a similar piece of content. Now after writing your article, you can reach out to these same people, and ask if they would like to share yours. Since they’ve already shared something similar, the probability of them sharing your article is very high. BuzzSumo also has an influencer search that’s very similar to other influencer tools like PeerIndex and Followerwonk. Using the influencers tab, I can see the main influencers in Mobile Learning more generally, see image below. BuzzSumo also allows you to filter by category of influencers such as journalist, blogger, etc. If I find a really relevant influencer, I can follow them directly from BuzzSumo or add them to a Twitter list. Now, finding influencers for a topic is nothing new. It’s not that hard to gather a long list of people. But how do I reach out to them effectively and convince them to share my content? With BuzzSumo, I can easily see what types of content an influencer has shared in the past. This tells me what they’re most likely to share in the future. Next to each influencer result, if I click on ‘view links shared’, this shows me, from most recent to least, the links they’ve shared in Twitter (see image below). For example, for this influencer I found, Gary Woodill, I can see that he has shared other content on mobile learning. I can analyze the links an influencer has shared by domain by clicking the Analyze Links tab. Below are the links shared by mobile learning influencer RJ Jacquez. From this I can see potentially useful sites for both research and for distribution. BuzzSumo is a really cool, innovative tool with lots of possibilities for content marketing research. In addition to content and influencer research, you can even use it to curate fresh, trending content. It’s free at http://buzzsumo.com, give it a try and let me know what you think! Featured image credit : velocitydigital.